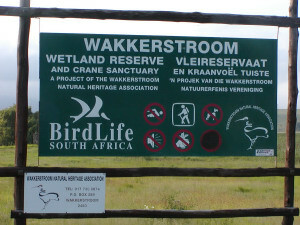 Organised by SAFRING and BirdLife South Africa. Photo H.D. 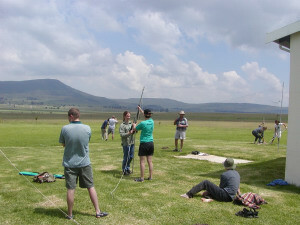 Oschadleus In January 2004 the seventh national ringing training course was held in Wakkerstroom (the third in Wakkerstroom). 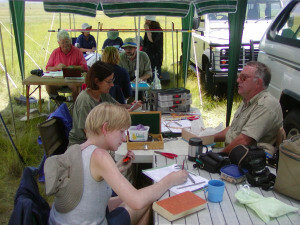 This time there were 17 ringers and 19 trainees, ringing over 2600 birds in one week, the second highest total for a national ringing course (2656 were ringed at Witsand). 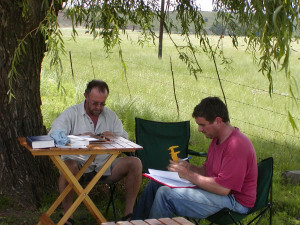 Olivier Dehorter, of the French ringing scheme, paid us a visit for two days and gave some helpful hints! Selected photos below illustrate some highlights. Photo H.D. 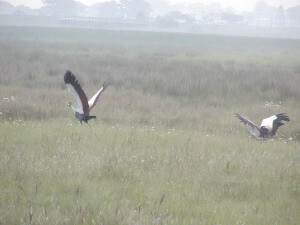 Oschadleus The resident Crowned Crane pair at the vlei. Photo H.D. 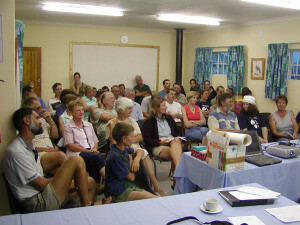 Oschadleus On Sunday afternoon most of the lectures were given to the trainees. They were also given practice in putting up mistnets. Photo H.D. 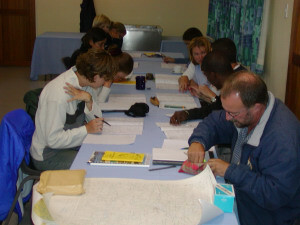 Oschadleus Finding coordinates on maps. Photo H.D. 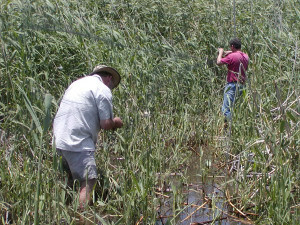 Oschadleus Netting in the reed beds. Photo H.D. Oschadleus The Oschadleus camp. Photo H.D. 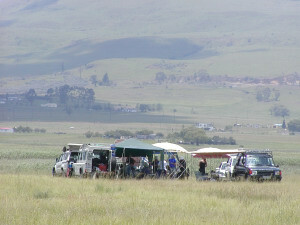 Oschadleus The Raimakers camp - ringing in comfort! Photo H.D. 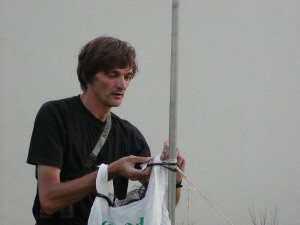 Oschadleus New net management method - Olivier demonstrated how a Pick 'n Pay plastic bag can be used to store a net, without ever getting the loops entangled. Photo H.D. Oschadleus A full class for evening talks. 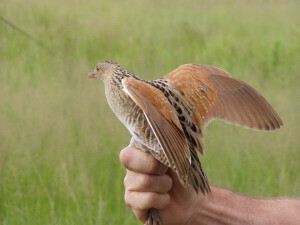 Photo Kobie Raijmakers Corncrake - highlight of the week. Photo H.D. Oschadleus Arie again made sure that the "pen-slaners Unie" was not forgotten. 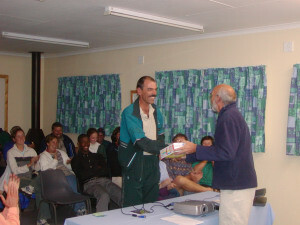 Here handing over a box of cornflakes to Dawie for a garbled message about corncrakes! 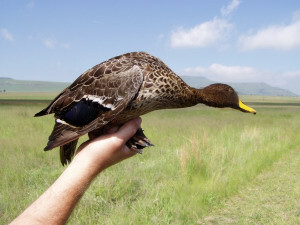 Photo Kobie Raijmakers Yellowbilled Duck caught in a mistnet. Photo H.D. 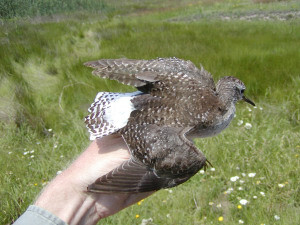 Oschadleus Wood Sandpiper caught in taiwan net. Photo H.D. 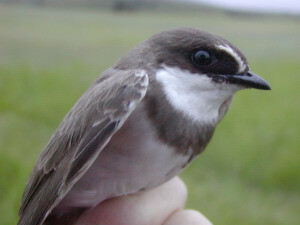 Oschadleus Banded Martin. Photo H.D. Oschadleus Pair of Orange-throated Longclaws. 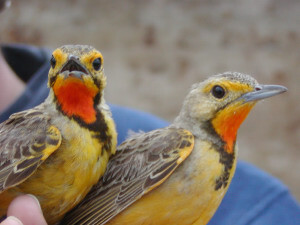 Male with the brighter throat is on the left. Photo H.D. 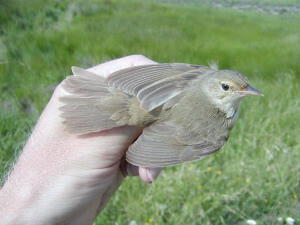 Oschadleus European Marsh Warbler - there was an influx at Wakkerstroom, and 21 were ringed. Photo H.D. 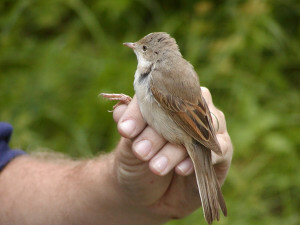 Oschadleus Whitethroat - note the rufous edges to the primaries. Photo H.D. 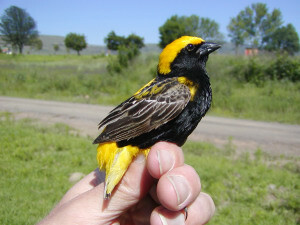 Oschadleus Golden Bishop male. Photo H.D. 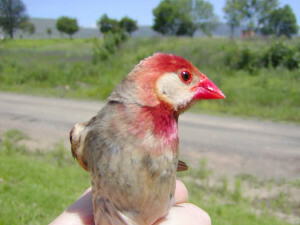 Oschadleus Redbilled Quelea, male with white-faced morph. Photo H.D. 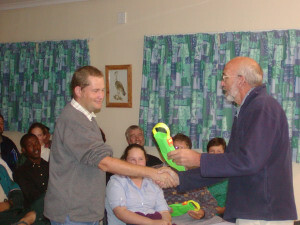 Oschadleus Arie handing over the Flipper award to Mark Brown.